The whole circuit was long: more than 30km. Most of the churches were at least an hour on foot away from each other. The pilgrimage was popularized in the 16th-Century by Saint Filippo Neri but today has fallen out of use since much of the route now lies in urban areas on the outskirts of the city, cut through by dual carriageways and busy roads. 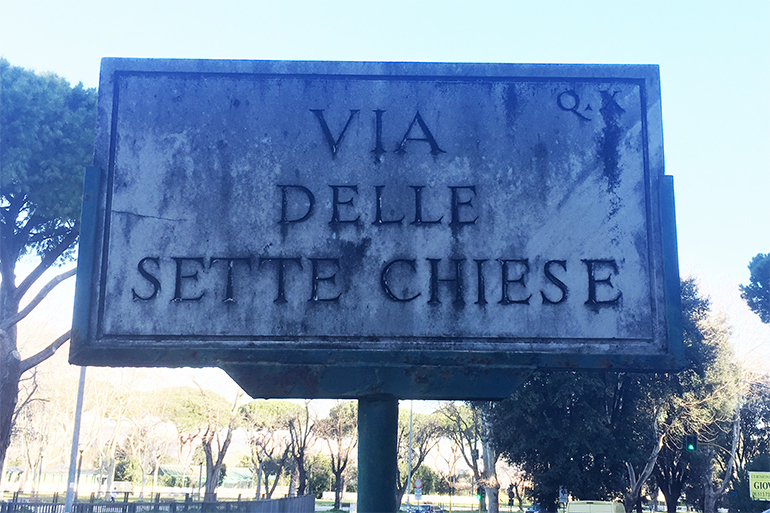 I first learned about this when I discovered that a road near the Basilica of San Paolo Fuori le Mura is called ‘Via delle sette chiese’. This was indeed part of the route. A little research on Google Maps led to the discovery that even today, most of the pairs of churches on the route are linked by a single road. So, I decided to set myself the Seven Church Challenge: walking the route of the Via delle Sette Chiese in a single day. I planned the route carefully and timed it so that I could arrive at each church during opening hours. San Lorenzo, for example, closes between midday and three-thirty. I left the first church at eight in the morning and arrived at the last at half-past two. It’s not an easy walk and I must confess that I had a sore knee by the time I’d finished. It is however, very rewarding and you get a very good idea of the size of the city of Rome as well as seeing some important sites. The route starts in the south of Rome and takes you north-East, some of which skirts the still existing city walls. The second half of the route takes you right through the historic centre of the city. The first two legs pass along very busy roads, the second part of which, doesn’t have real sidewalks, so a bit of attention is needed. The Basilica di San Paolo fuori le Mura is one of the four Papal Basilicas. It’s situated on the Via Ostiense, the ancient road which once led from Rome to the port of Ostia, today a busy modern road. It is famously built over the top of an Ancient Roman cemetery, parts of which can be seen in the grounds. The high altar is built over what is thought to be the tomb of Saint Paul, the Apostle. The Basilica di San Sebastiano fuori le Mura is located along the Via Appia Antica, the ancient road which once led from Rome to Brindisi in Puglia. It’s in the area of Rome where the catacombs are and in fact there is a set of catacombs under the church. It contains what is supposed to be the tomb of Saint Sebastian, martyred by a hail of arrows. The Basilica of San Giovanni Laterano is the cathedral of Rome and the official seat of its bishop (aka the Pope). It’s situated just inside the walls of Rome in the east of the city. It too is one of the four Papal Basilicas. The Basilica of Santa Croce in Gerusalemme is very close to San Giovanni and so the part of the walk linking the two is the shortest and most pleasant. It houses what are supposed to be relics of the Jesus’s cross and the ‘titulus’. This is a sign, written by Pontius Pilate saying, ‘Jesus of Nazareth King of the Jews’ attached to the cross above Jesus’s head during the crucifixion. The Basilica of San Lorenzo fuori le Mura contains the tomb of Saint Lawrence, who was martyred by being cooked on a grill. The grill is preserved near his tomb. It started life as an Ancient Roman basilica—a covered meeting hall, most of which were converted into churches later—and the ancient columns are still preserved in the interior. The Basilica of Santa Maria Maggiore, the third of the four Papal Basilicas, is the most important church dedicated to the Virgin Mary in Rome. It contains a relic of the manger that the baby Jesus was laid in when he was born. The Basilica of San Pietro in Vaticano needs no introduction. It’s the fourth of the Papal Basilicas and is located in Vatican City. It too is built over an ancient cemetery with the tomb of Saint Peter supposedly under the high altar. If you are thinking of trying this route, my advice is to take a water bottle with you, which you can fill up for free at Rome’s nasoni, drinking fountains located along the route. There are many good places to eat along the way particularly between San Giovanni and Santa Croce, between Santa Maria Maggiore and San Pietro, and around San Pietro at the end. One of my favourite street-food stops, Mondo Arancina, is not far from San Pietro and is where I rewarded myself with an arancina and a Catanese cipollina at the end.